Below is the text of a press release received today from Nestles public affairs consultants concerning the appointment of a new developer for its former bottling plant site in Station Road, Buxton. Once the developers have their proposals ready, a special meeting will be arranged with the developers and members of the Buxton Civic Association. Nestle Waters has selected a new partner, Cheshire-based developer Consolidated Property Group (CPG), to develop its former bottling site in Station Road, Buxton. Based in Alderley Edge, CPG has gone back to the drawing board with the site and held extensive discussions with adjoining landowners Network Rail, DB Schenker and Peak Rail, as well as pre-application discussions with High Peak Borough Council. CPG is proposing a mixed-use scheme including restaurants, small shops and an 80 bed budget hotel alongside a single storey foodstore - smaller than that previously proposed. The new plans will also include improved car parking and access for rail users and better pedestrian integration with the adjoining rail station and the town centre. A formal consultation programme will begin in the near future with a public consultation display in September, the details of which will be announced early next month. It is anticipated that a planning application will be submitted by the end of September. Butterfly theatre is a familiar name to anyone who has been around for previous Buxton Fringes. For the last four years, they have graced Poole's Cavern with their performances of some of Shakespeare's most famous plays - A Midsummer Night's Dream is the one most people seem to recall - but this year they went in a slightly different direction. The new script 'Dracula's Women Underground' drew in large audiences each night, managing to attract both Fringe newcomers and long-time fans. Written for the cave setting, it told the story of Mina, Dr Seward, Van Helsing, and Renfield, attempting to track down Dracula after Lucy's death, but instead encountering his three vengeful brides. Each character was pleasingly true to their portrayal in the book, and while some artistic liberties were taken with the script, it set up an intricate adventure through the cave and back as the audience followed the vampire hunters on their quest. The actors put the space to great use, crawling under the bridge, and scrabbling up the sides of the river bed. 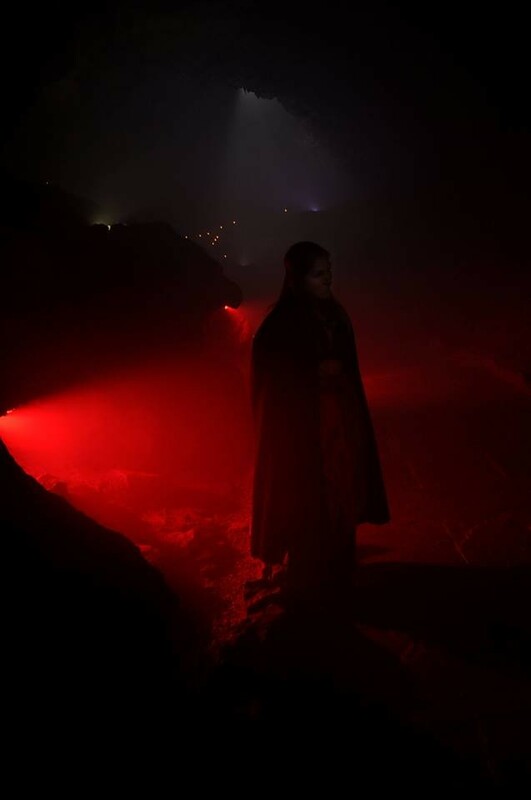 The cave made a wonderfully spooky setting for such an iconic, Gothic book, bathed in red light and full of mist.